The rotating service structure, which provides weather protection and access to the shuttle, moves into place around space shuttle Discovery on Launch Pad 39A at NASA's Kennedy Space Center in Florida. CAPE CANAVERAL, Fla. – The space shuttle Discovery stands ready for its planned liftoff in two days from NASA's Kennedy Space Center here, on what will be the orbiter's final journey to space. "Over the last two months, the team has been very busy," NASA test director Steve Payne said in a news briefing today (Feb. 22). "Discovery is poised to lift off on Thursday afternoon, bound for the International Space Station, to do what she does best." 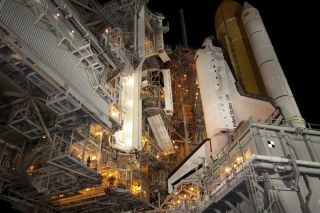 Late Sunday night, a minor leak was detected on a regulator in the shuttle's reaction control system, Payne said, but the leak was within acceptable limits in a system with numerous backups in place. It is not expected to impact to the countdown or launch, he added. At the launch pad, technicians are loading liquid oxygen and liquid hydrogen into Discovery's Power Reactant Storage and Distribution system today. This system holds the chemicals used by the shuttle's three fuel cells to produce electricity in space. The oxygen is also used to pressurize the space shuttle's crew cabin. Current weather forecasts are predicting an 80 percent chance of clear skies for Thursday's launch. "Weather does look very favorable for the next few days coming up into launch," shuttle weather officer Kathy Winters said. "Overall, really no significant weather expected up through launch day." Meanwhile, the crewmembers of Discovery's STS-133 mission are finishing up last-minute training exercises and reviewing launch day procedures. Commander Steve Lindsey and pilot Eric Boe will practice landing approaches at the Shuttle Landing Facility in a modified Gulfstream II jet that simulates the space shuttle's cockpit, motion and handling. Discovery's 11-day mission to the International Space Station will be the orbiter's 39th and final flight. It also marks NASA's 133rd shuttle mission, which is one of the final three shuttle flights before the space agency brings its 30-year space shuttle program to a close later this year.